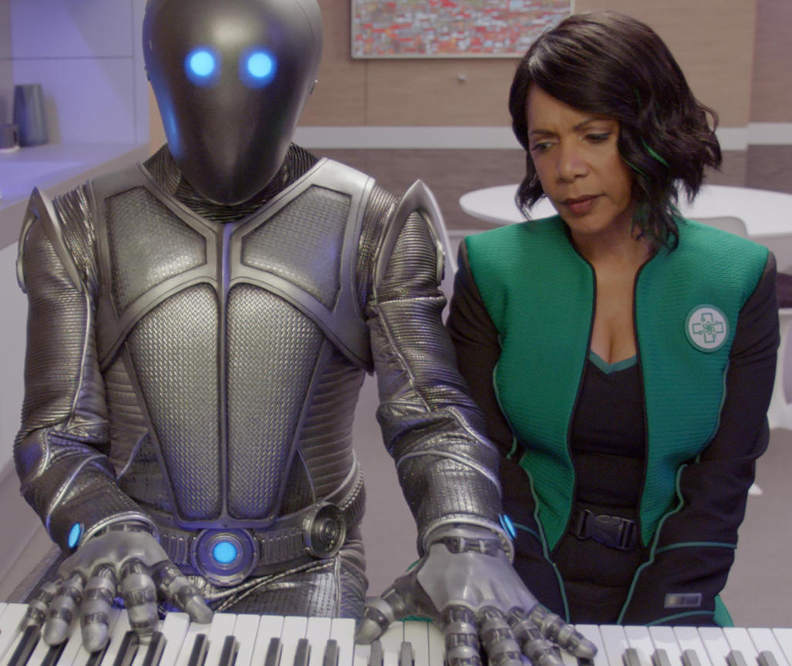 Although I was happy to see Seth MacFarlane’s Star-Trek-spoof/homage The Orville return for a second season this year, I didn’t have much more to say about it, despite the replacement of ‘Lt. Alara Kitan’ (Halston Sage) by ‘Lt. Talla Keyali’ (Jessica Szohr) as the ship’s super-strong security officer. I’m not going to get into the backstage gossip about why Sage was jettisoned from the show, but I was glad she got a decent send-off, with a starring role in a solid and suspenseful episode (#2.3), capped with lots of sweet (and open-ended) goodbyes. This series rarely taxes the brain, and actually gets a little worse the more you dwell on the plot-holes, but it definitely gives the tear-ducts a regular workout… and that was extra-specially true with this week’s episode (#2.6), as the seemingly level-headed ‘Dr. Claire Finn’ (Penny Johnson Jerald) finally admitted her long-simmering feelings for coldly-logical (but surprisingly supportive) mechanoid ‘Isaac’ (Mark Jackson). The ups-and-downs of their dating experiment would give any rollercoaster a run for its money, and sap that I am, I bought into it hook-line-and-sinker… largely because of Jerald’s performance, as her giddy excitement and patient romantic tutoring (metaphorically) melted Issac’s shiny metal “heart” (or at least, disrupted his subroutines). Bless. MacFarlane (the writer of this episode, as well as the showrunner) is unashamedly indulging his sentimental side here, while giving his female cast-mates some fantastic material to sink their teeth into, and I for one salute him. Oh, and for the record, I thought ‘Bortus’ (Peter Macon) was really rockin’ that ‘tache. This entry was posted in Rants about TV and tagged Alara Kitan, Claire Finn, Halston Sage, Jessica Szohr, Mark Jackson, Penny Johnson Jerald, Peter Macon, Seth MacFarlane, Star Trek, Talla Keyali, The Orville. Bookmark the permalink.